Panasonic, an industry leader in reliable and innovative mobile computers since 1996, today at the 2014 International CES announced the U.S. availability of the Toughpad™ 4K UT-MA6 tablet, the performance model of the world’s first* 20-inch tablet with a 4K resolution display. Featuring an Intel® Core™ i7-3687U vPro™ processor with an NVIDIA® Quadro® K1000M GPU, and an advanced beyond Ultra HD 4K display providing a lifelike viewing experience unlike any tablet on the market, the Toughpad 4K performance model is built to serve as an ideal mobile workstation for professionals in visual-intensive fields such as computer-aided design (CAD) and video editing. The Toughpad 4K performance model further expands Panasonic’s Toughpad line to create the world’s most comprehensive portfolio of enterprise-focused tablets. It expands the capabilities of the groundbreaking Toughpad 4K UT-MB5 tablet announced in 2013, a business-rugged tablet with a brilliant 230 pixel-per-inch display that goes beyond Ultra HD resolution. Optimized for the Windows 8.1 Pro operating system and built on the Intel®vPro™ platform, the Toughpad 4K tablet bridges the gap between the needs of IT professionals and workers by including unique hardware and OS-based enhanced security features, remote manageability and capabilities designed to increase end user productivity and data protection. Like the standard model, the Toughpad 4K performance model offers an optional Panasonic Electronic Touch Pen, a unique new device offering pixel-level precision and a distinctly pen-and-paper-like feel for freehand sketching, annotation or handwriting. The pen uses infrared signals to distinctly read each pixel on the screen and communicates with the tablet via Bluetooth®. For natural and highly accurate drawing or handwriting, the pen can be held from various angles and can interpret more than 2,000 levels of pressure. 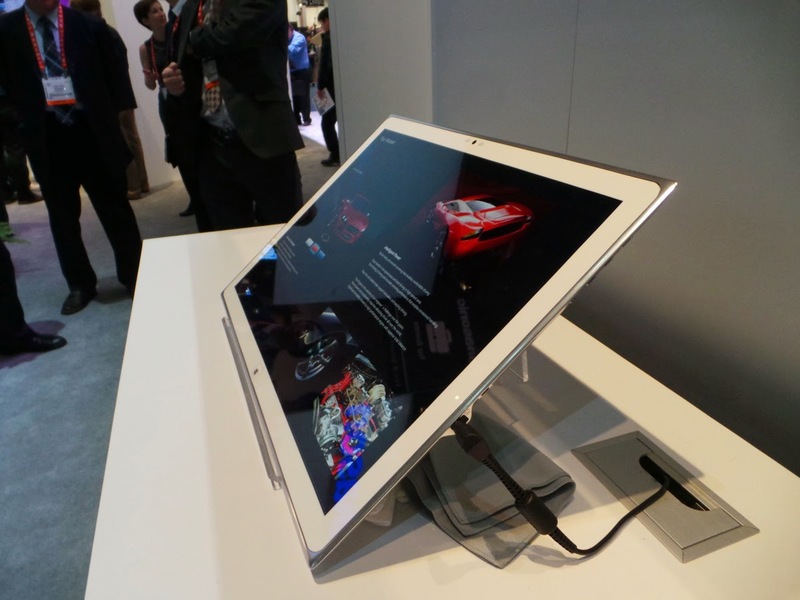 The Toughpad 4K also offers 10-point multi-touch input. Combined with accessories such as the optional Panasonic desktop cradle and carrying case solution, the device can be used as both a desktop PC and tablet. The cradle easily converts into a tilted stand to allow the tablet to be used in drafting table mode, and offers USB 3.0 x3, Ethernet and HDMI-output connectivity. A VESA-compatible mounting adapter plate is also available. The Toughpad 4K performance model, powered by a third-generation Intel® Core™ i7 vPro™ processor and NVIDIA® Quadro® GPU, will be available in Spring 2014 at a list price of $6,999. The previously announced Toughpad 4K standard edition, featuring an Intel® Core™ i5-3437U vPro™ processor with an NVIDIA® GeForce® 745M GPU, will be available in February 2014 at a list price of $5,999.